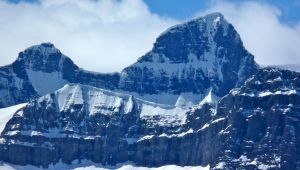 This peak is #74 on the Height List for Alberta .Located 3 km southeast of Thompson Pass. The normal summit route is via the glaciated south ridge. Name Notes: Named after Sir Cecil Arthur Spring-Rice (1859-1918) who was the British Ambassador to the United States from 1912 to 1918. He was ambassador during the months following the sinking of the Lucitania, at which time the United States was brought into the war against Germany. Spring-Rice had earned the enmity of his government after becoming paranoid - seeing German spies everywhere - and also because of his immense dislike of any British visitors to Washington that were not under the control of his embassy.